Foils are a type of weapon used for fencing. They are the most commonly used weapon used for competition and training classes for modern fencing. Our classically styled ornate fencing foils are dry, or nonelectric, foils and include a pommel, grip, guard, and tempered steel blade. These fencing foils have blunted or foiled tips. Our Spanish Fencing Foil with Engraved Gold Finish comes with an intricately engraved Gold plated guard with red and white highlights, wooden grip and tempered steel blade with foiled tip. Our Spanish Fencing Foil with Engraved Gold Finish comes with an intricately engraved Gold plated guard with red and white highlights, wooden grip and smaller tempered steel blade with foiled tip. Our Toledo Italian Fencing Foil is Tempered Steel, "Battle-Ready" and features a 19th Century Design. Length is 40.2", weight is .77 pounds. Our Toledo French Fencing Foil is Tempered Steel, "Battle-Ready" and features a 19th Century Design. Length is 40.2", weight is .77 pounds. Our Toledo Black-handled Fencing Foil is Tempered Steel, "Battle-Ready" and features a 19th Century Design. Length is 40.2", weight is .77 pounds. This Stage Combat Sabre is based on the military sabres of the 19th Century. These sabre fencing blades are durable enough for sports fencing and are becoming increasingly popular with historical fencers and HEMA (historical European martial arts) practitioners. Made in the UK. Our Toledo Spanish Fencing Foil is Tempered Steel, "Battle-Ready" and features a 19th Century Design. Length is 40.2", weight is appx. 15 oz. 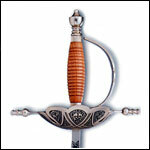 Our Toledo Rose Fencing Foil is Tempered Steel, "Battle-Ready" and features a 19th Century Design. Length is 40.2", weight is .77 pounds. Our Toledo Shell Fencing Foil is Tempered Steel, "Battle-Ready" and features a 19th Century Design. Length is 40.2", weight is .77 pounds.